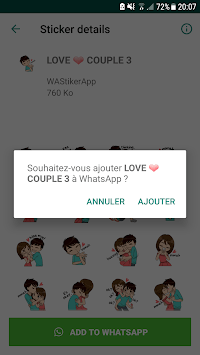 Couple Story Stickers Packs - WAStickerApps is the best application with which you can share Love Romantic stickers packs with your Girl Friends or wife on WhatsApp and make her Day more special. We offer you assorted stickers packs for all types of love, so you can choose the one you like best. Couple Story Stickers Packs and Love Stickers and Romantic Stickers for WhatsApp? 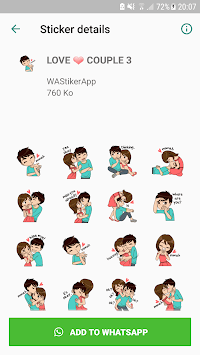 WAStickerApp provides Sticker Pack with many categories like Love Couple Stickers, Romantic Sticker, Text Stickers, Fairy, Teddy Love Stickers, Love Quote, Girls Nick Name Stickers, Boys Nick Name Stickers and many More.